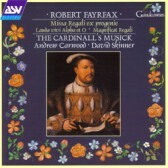 The final disc in the series carries a fine picture of King Henry VIII on its front cover as the antiphon Lauda vivi Alpha et O sets a prayer specifically in his honour – probably the last example of such. This fine piece is coupled with a Mass and Magnificat which through its title (Regali) suggests a royal connection. The Mass is probably the most concise of Fayrfax’s settings but has his hallmark of sweeping melody and carefully graded textures. With the two secular songs this disc represents the final instalment in the complete works of one of England’s greatest composers.